Destination America is headed to one of the nation’s most haunted places. Recently, the network announced their new series Ghosts of Shepherdstown premieres in June. 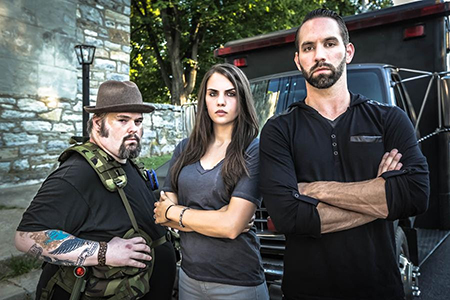 The six-part docu-series will feature a team of paranormal investigators uncovering the mysteries of Shepherdstown, West Virginia—a small town claimed as one of the most haunted areas in America. Ghosts of Shepherdstown debuts on June 12th at 10 p.m. ET/PT. Nick Groff has been fascinated with the paranormal ever since surviving a near-death experience as a child. Now, he chases ghosts full-time with the goal of finding new evidence of the afterlife and discovering a breakthrough in paranormal research. After graduating from the University of Nevada with a B.A. in Film, Groff made his big break when he co-wrote, co-produced, co-directed, co-edited, and co-starred in Ghost Adventures: The Original Documentary, which aired on the SciFi Channel in 2007. The film was a winner at the Los Angeles Film/Video Festival and was nominated for “Best Feature Film” at the Eerie Horror Film Festival. The documentary served as a pilot for the Ghost Adventures television series that debuted in 2008 on Travel Channel. Groff was an Executive Producer, co-host, and investigator on seasons 1-10. Groff is also the author of the book Chasing Spirits: The Building of the Ghost Adventures Crew. Now, Groff is the Executive Producer and Host for the hit series Paranormal Lockdown on Destination America. Elizabeth Saint has demonstrated a sensitivity to the supernatural. The manifestations she first experienced as a child led her to pursue a life dedicated to explaining the unexplainable. Being struck by lightning on two separate occasions sparked Saint’s interest in the natural phenomena of electricity. While completing her B.S in Electrical Engineering, with a concentration in Electrical Systems Technology, she worked as an Engineer Technician for the Department of Defense. During this time she also deepened her understanding as a sensitive by working with Maryland Paranormal Research(R) as a Technician and Senior Investigator. Presently, Saint is exploring her new home state of Colorado and conducting solo investigations at commercial and residential locations along the Front Range. She uses her own engineered designs, under the name Ghostly Gadgets, during these investigations to further her research of the paranormal. Bill Hartley’s introduction to the paranormal began during childhood, growing up in a house that was wrought with unusual paranormal activity. As an adult, he became a Civil War re-enactor and founded the Fighting 57th North Carolina, in which he reenacted as his ancestor 1st Sgt. Jonas Hartsell. After witnessing unusual activity at historic locations, Hartley was inspired to pursue paranormal investigation. The unexplainable phenomena Hartley witnessed led him on a journey to discover as much as he could about the paranormal. In 2006, he founded the Greater Maryland Paranormal Society and dedicated himself to helping others living in fear of the mysterious unknown. Hartley believes it is important to have a balanced point of view when it comes to the paranormal investigations. While he does believe locations can be haunted, he remains a skeptic at the same time. Hartley currently works at one of the most haunted locations in Maryland, the Westminster Hall and Burying Grounds that houses some of Maryland’s most historical figures including Edgar Allen Poe. What do you think? Do you enjoy ghost-hunting TV shows? Will you watch Ghosts of Shepherdstown? More about: Destination America TV shows: canceled or renewed?, Ghosts of Shepherdstown, Ghosts of Shepherdstown: canceled or renewed? Was quite disappointed in the 2nd season finale. All the objects in the ‘pentagram’ disappeared when the ‘Hey there’s a SPIDER in the pentagram’ moment happened. FAKE, sorry just another fake ‘ghost’ program just like all the others. Very entertaining though, I must admit. I am convinced Nick G. Wrote all of these comments… if this place is so haunted why hasn’t any other team been there. Just shows that all Nick cares about is fame. I mean Elizabeth is known as an actress on imbd. Nick will be known for making hilarious ghost hunting comedies. People seriously go find a history book on the town and area. What happened to Katrina? Why was she replaced? I thought it was interesting, not a horror series more of a educational show about the Paranormal. I feel that the second season should also try and explain how the investigations were solved, and by whom. Please credit the Psychic/Medium who does the real work, not just setting up equipment. If you are referring to Miss Johnson she is a fake…. you should go add to her gofundme account. Although I have a feeling this is her posting under an alias since I’ve seen the same name and grammatical use of words on several other sites. I am very happy that the case was solved in Shepherdstown, however I am very sad that it is over I was 100% hooked on this show. You three did an amazing job and I thank you for what you do. Without people like you sprites would not be put to rest and people wouldn’t be able to carry on with their daily lives in peace. I hope to look forward to seeing Elizabeth, Nick & Bill in the future. Love, love, love this series and Nick. Keep up the good work. I’ve thoroughly enjoyed watching this show since I am also a sensitive. However the finale seemed too staged. I feel Clair is definitely an actress & if this much activity is happening in the most haunted town in America, how can it be cleansed in a set period of time and all move on? I am enjoying this show. Lorie really impressed me so I started following her. Last night there was a live remote viewing broadcast I watched. At the beginning Lorie stated ‘free 15 minute reading’ to the 1st correct answer to singers identity. I was the first to answer correctly & today find myself “Blocked’, and my name deleted from the entire chat, tho there are references from others to me still there.So though her medium skills are real & astounding, she’s just another psychic who doesn’t keep her word! Love the show. I grew up in Shepherdstown and love to see the town get some national attention. Hope to see the series continue for many more seasons. I love this show. I look forward to Sunday nights. Everybody is amazing. Great show. Can’t wait for the next episode!